Whether it's been a slow week or the days have gone by quickly, I'm always looking forward to the weekend. Ideally, I like to sleep in and make something a bit more elaborate for breakfast than a hard boiled egg with chickpeas, salsa and a slice of cheese, which has been my breakfast at work this past week. Sometimes I go to bed Friday night dreaming of iced coffee, challah toast slathered with mayonnaise and topped with thick slices of tomatoes or avocado toast with sea salt and pistachios. Occasionally I defrost a croissant from Trader Joe's and impatiently look at the oven clock for 20 minutes while the croissant expands and bakes in the oven. Last weekend I made something savory and fast: potato and red onion hash with a fried egg and sliced avocado topped with sriracha. You really don't need a recipe for this of course. The important part is to dice your potatoes into even pieces and start cooking them before adding the onions. Make sure to season your hash with salt and pepper. If you are cooking for one, you can use the same skillet to fry the egg once the potatoes are just a few minutes from being completely done. 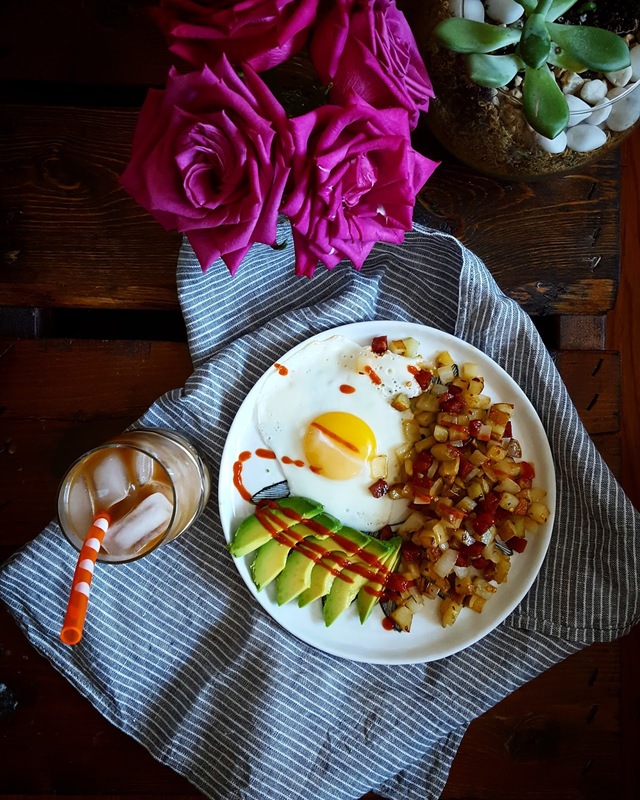 Having fresh flowers and iced coffee with a fun straw elevates this simple breakfast for sure! What are you dreaming of for this weekend? How do you treat yourself?